Leigh has helped us with all aspects of marketing including our exciting new re-brand in 2012. We have many different pillars to our business so it can be quite a challenge to market our business as a whole effectively. Leigh managed all this with flair and across many platforms with skill and sound knowledge and she is very much part of the Bangwallop team. I would recommend her to any business needing sound marketing advice. 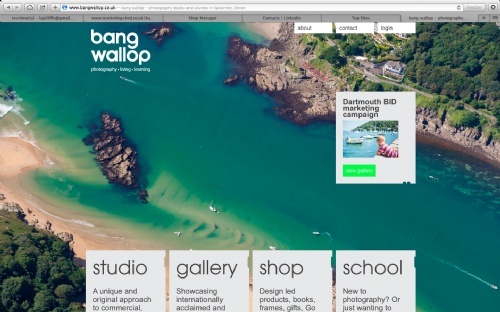 Bangwallop is a fresh, innovative and contemporary photographic concept store based in Salcombe, South Devon. Lorna Yabsley, founder and acclaimed principle photographer, approached the marketingshed in January 2012 as she had identified the need to refresh the bangwallop brand so that it could appeal to a wider audience and needed help managing its marketing activity. Since then, the marketingshed has overseen all marketing activity for bangwallop including; managing the original pitch process and re-brand project; training staff to use brand guidelines and approving all internal communications; creating and managing the marketing communications plan and social media strategy; managing external creative agencies for a variety of communications including web and social media platforms, adverts, brochures, postcards and posters as well as copywriting customer newsletters and emails, media buying and PR.